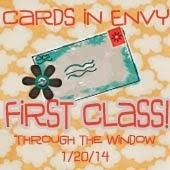 Here is my card for the current challenge at Cards in Envy. I used Paula's digi to create a "Mother's" Day card for OWH. I love that her digi leaves a little room to add an small element in place of the O. Papers are from my scrap pile. Nice green card. Love how you used the heart over the O. Thanks for playing along with us at Cards in Envy. Beautiful Mother's Day card! I love the different papers and layering and the heart in the "O" is perfect! 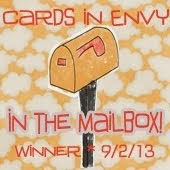 Thank you for sharing with our Think Green challenge at Cards in Envy! Hi Linda! I'm finally catching up on some blog visits and can see you' ex been busy making a lot of really nice cards. I love what you did with the layered circles, heart and brad to complete the digi. Beautiful color combo too! super cute, love the pop of twine in the O!!! sooo much for playing along with Cards in Envy!!! !